On Monday after a visit to the University of Cuyo in Lujan and a meeting with the Dean and other wine economics professors, we visited the charming “wine village” of Chakras. It is situated in the middle of the vineyards and wineries, and just a short 20-minute drive from downtown Mendoza. Filled with shops and restaurants, I thought this would be an ideal place in the future for wineries to establish mini-tasting rooms, similar to the town of Healdsburg in Sonoma County. We had an excellent lunch at the Chakras at Tea & Company where we were served fresh organic food, salads, and unique teas. Despite being turned away from the first winery, we kept driving and searching for a place to taste. However, most were closed by 4:30 in the afternoon. I was getting disappointed when we approached a small winery with a sign that said open until 6pm. Even better they allowed visitors to drop in without an appointment. The name of the winery was Carinae , which is Latin for Constellation. Started by a French family, they have 17 hectares of grapes and are in Lujan de Cuyo appellation. 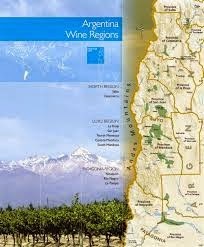 The grow and produce malbec, cabernet sauvignon and, syrah, and each wine is named after a different Constellation. Currently they have 15 employees and produce 100,000 bottles. We toured the cellars, and learned about the winemaking process. Sorting table, stainless steel fermentation, and aging in older barrels. Interestingly, total maceration time for the high-end malbec is around 30 days. It was also aged in French oak for 18 months. Next we visited the malbec vineyard next to the winery. It was quite old – at least 30 to 40 years with massive trunks on a VSP trellis with double cordon. They had mounds of soil in the middle with the channels on each side to water the vines. As it was an old vineyard, there were olive trees growing in the middle of it, and a nearby olive orchard planted in the old way with vegetables growing underneath the trees. Back in the tasting room, I was surprised to see that the price to taste rivaled that of Sonoma County. There were 7 different tasting ranging from 50 pesos ($5) for 5 simple wines to 200 pesos ($20) for all 15 wines. I chose a mid level tasting of 5 different malbecs for 80 pesos ($8). It was interesting, because it started with the unoaked joven malbec and when through the range to the high-end oaked Carinae Malbec Gran Reserva 2010. I did find that I liked some oak on my malbec, and didn’t enjoy the simplicity of the unoaked ones. The Gran Reserva was dark, more complex, with some coffee and earth notes mixed with the blue berry. I ended up buying a bottle for around $24. The bottle prices were reasonable, even if the tastings were not. We also paid an extra 25 pesos to taste the Passito Pink Moscato dessert wine made with dried grapes. It was aromatic, sweet, and delicious. Our tour guide conducted the tasting, and he was very professional. I was impressed with the obviously excellent hospitality training he had received. That evening we went out for a steak at the Hyatt and had a glass of 2011 Rutini Malbec for 95 pesos, and it was exquisite with concentrated plush fruit and velvety tannins.